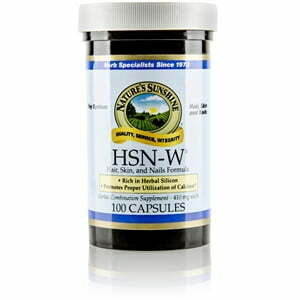 Nature’s Sunshine HSN-W® (Hair, Skin, and Nails Formula) combines herbs that are rich sources of herbal silica, a substance that nourishes the human structural system. 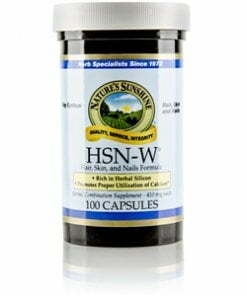 Silicon combines with calcium to strengthen bodily tissue and improve skin tone. Horsetail and dulse are two of the most significant sources of herbal silicon known in herbology. Both sage and rosemary, two other herbs in the HSN-W formula, are rich sources of antioxidants that protect the body’s tissues.